← The Room signs to Bad Elephant Music; digital single released. “In the Fullness of Time” is an album that I have been quite interested in hearing for a while now. The band features Pete Morten on lead vocals and lyrics (Threshold, My Soliloquy) and the talents of chief music writer and guitarist Sam Shuttlewood. These guys can definitely craft a powerful, technical song that is still very catchy and melodic. The album starts with the prelude “The Mara” which unlike some intros, it’s a great start to the album and very symphonic. The first track released, “In Memoria Di Me” has the riffs and melody that are standard for the entire album. It also has some incredible high notes that made me wonder why Pete Morten is not the vocalist in Threshold! He is “just” one of the guitarist in that more well known band. “The New Crusade” is shows the band can make very interesting power metal, in the vein of Blind Guardian. The song has some very tasty soloing that are never too fast like some bands do. That’s another reason I love “In the Fullness of Time,” the solos always serve the song and never are used to show off. “No Regrets” is a groove laden song that is full of drama and has an epic feel despite being a shorter track. That’s another thing I love about the album as a whole. It is very cinematic and epic. The songs might not be ten minutes but they are just as massive as any song of that length. The longest track is “Damage Report” which is under six minutes, but feels like it’s longer (in a good way). “Damage Report” is also my favorite track on the album with a very cool middle section dominated by a synth solo over piano which gives Nick Clarke a chance to shine. Still, it’s impossible not to mention the vocals of Pete Morten. His range and power are the main highlight of the album. Granted, great vocals would be nothing without great songs like the slower yet heavy “Defiance” or the hooky “Burden of Proof” or the ballad-like “The Ever Becoming.”. While some people might question if the album is too short at just under 38 minutes, I think it’s better to not have a weak moment or wasted note. 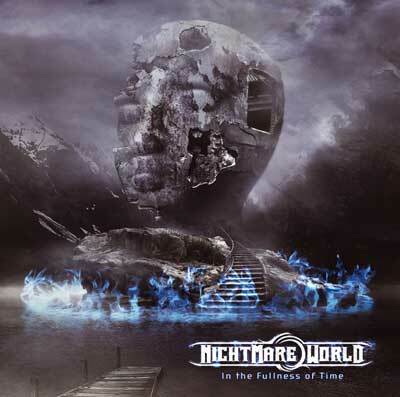 And on “In the Fullness of Time,” Nightmare World have proven that an album should be about the songs. Hopefully, people will not miss out on this metal showcase. The album should appeal to fans of progressive metal and power metal. Highest possible recommendation. This entry was posted in progressive metal and tagged music review, progressive metal. Bookmark the permalink.